Betula populifolia Marsh. Arb. Am. 19. 1785. B. alba var. populifolia Spach, Ann. Sci. Nat. (II.) 15: 187. 1841. A slender tree with very white smooth bark, tardily-separating in thin sheets; maximum height 45°; trunk diameter 11 /2°; the twigs russet, warty. Leaves deltoid, pubescent on the veins when young, nearly glabrous when old, minutely glandular, bright green above, light green beneath, long-acuminate, sharply irregularly dentate and commonly somewhat lobed, obtuse or truncate at the base, 1 1/2'-2 1/2' long, 1'-2' wide, slender-petioled; petioles channeled; staminate aments 2'-3' long; pistillate aments cylindric, in fruit 9"-18" long, 3,"5" in diameter, slender-peduncled; fruiting bracts puberulent, 1"-2" long, lateral lobes divergent, larger than the middle one; nut narrower than its wings. In moist or dry soil, Nova Scotia to southern Ontario, Pennsylvania and Delaware. Wood soft, weak, light brown; weight per cubic foot 36 lbs. Leaves tremulous like those of the aspens. Gray-, poverty- or old-field-birch. Broom- or pin-birch. May. 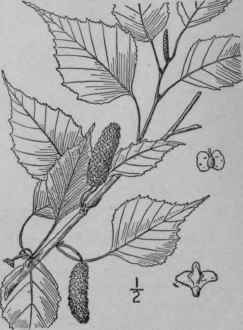 Setula coerulea Blanchard, Betula 1. 1904. 3. coerulea-grandis Blanchard, loc. cit. 19.04. A tree, attaining a maximum height of about 65° and a trunk diameter of 2°, the bark white, readily peeling off in thin layers, the young twigs somewhat pubescent, becoming glabrous. Leaves ovate, 2-4 1/2' long, serrate, long-acuminate at the apex, broadly cuneate at the base, when mature glabrous and dull bluish-green above, slightly pubescent on the veins beneath, the petioles slender, about 1' long; staminate aments 1 1/2-3' long; pistillate aments cylindric, about 1' long, on stalks about one-half as long; fruiting bracts with divergent lateral lobes; nut much narrower than its wings. Hillsides, Quebec to Manitoba, Maine and Vermont. 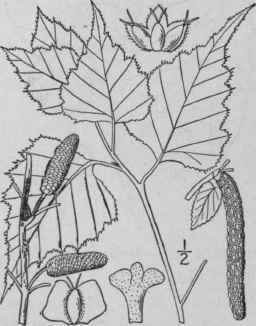 Resembles the European Betula pendula Roth. Detula papyrifera Marsh. Arb. Am. 19. 1785. Betula papyracea Ait. Hort. Kew. 3: 337- 1789. Betula papyrifera minor Tuckerm. Am. Journ. Sci. 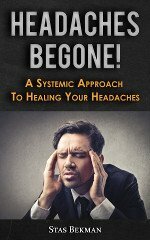 45: 31. 1843. 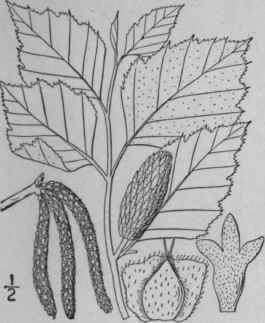 A large forest tree with maximum height of about 8o° and trunk diameter of 30, or on mountains reduced to a low shrub; bark, except of the young wood, peeling in thin layers. Leaves ovate, acute or acuminate, dentate and denticulate, subcordate, truncate or obtuse at the base, dark green and glabrous above, glandular and pubescent on the veins beneath, slender-petioled, 1 1/2-4 1/2' long, 1-3' wide; petioles 1/2-1 1/2 long; staminate aments 2-4' long; pistillate aments cylindric, slender-peduncled, 1'-2' long, 1/2'-1/2'in diameter in fruit; fruiting bracts 2"-3" long, puberulent or ciliate; nut narrower than its wings. Newfoundland to Alaska, Pennsylvania, Michigan, Nebraska and Washington. Similar to the Old World B. alba L. Wood hard, strong, reddish-brown; weight per cubic foot 37 lbs. The chalky-white outer bark interesting to tourists. Silver-, bolean- or white-birch. Spool-wood. April-May. 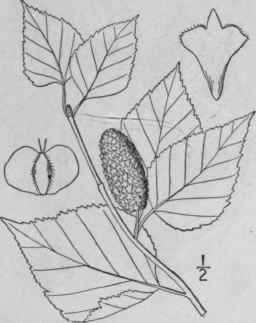 Betula cordifolia Regel, differs in having distinctly cordate leaves, but scarcely otherwise.